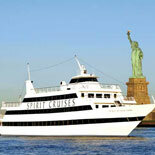 Let the Spirit move you on the Spirit of New York Gospel Lunch Cruise! 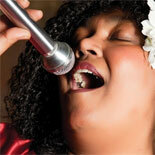 For a positively inspiring experience, you will enjoy a live gospel performance by a contemporary choir while you dine on a delicious lunch buffet and cruise the Hudson River. The Best Sights of New York are from the water! The Spirit of New York Gospel Lunch Cruise will deliver all of New York Harbor to your tableside, while raising your spirit with live Gospel renditions for the soul. No other venue in New York will show you the city like this. 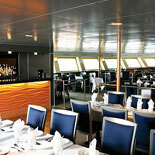 You will cruise the Hudson and East Rivers past the skyscrapers of Manhattan including the Empire State Building. You will see the Intrepid Sea-Air Space Museum, the Brooklyn Bridge, the site of the World Trade Center, Battery Park City, South Street Seaport, the Verrazano Narrows Bridge, Governors Island, Ellis Island and the Colgate Clock. Of course, the highlight of the Spirit of New York Gospel Lunch Cruise is the Statue of Liberty, one of the most celebrated landmarks in the world. For your next special occasion or just a unique way to get out on the water in New York, make your reservations today, get your eTickets and come aboard the Spirit of New York Gospel Lunch Cruise! Revive your Mind, Soul and Body, come back refreshed and relaxed. Operates on Select Saturday dates only. Please see calendar on reservation page for available dates or check Schedule on previou page. CRUISE TIMES: Boards: 11:30 am - Cruise: 12:00 pm to 2:00 pm. Chelsea Piers, Pier 61, West 23rd St New York, New York 10011 Tickets can be picked up at the dock, up to one hour prior to boarding, on the day of the cruise. The credit card used for purchase and photo ID will be required. 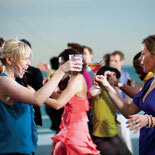 Chelsea Piers in Manhattan, there is ample paid parking available just steps away from ship. It is a covered lot with security. Prices vary depending on the amount of time you are parked. North River Property parking fee is around $42.00 for 4 hours.